U.S. Cellular has announced that it is launching the LTE version of the Galaxy Note 10.1 on its network in addition to the Wi-Fi version that was already available. The LTE version of the Galaxy Note 10.1 is now available from U.S. Cellular via both its website and in its retail store locations. The popular tablet will sell for $499.99 for the 16GB version when paired with a 2GB or more data plan. CHICAGO (February 27, 2013) – U.S. Cellular (NYSE: USM) and Samsung Telecommunications America (Samsung Mobile), the No. 1 mobile phone provider in the United States,announced the 4G LTE-enabled Samsung Galaxy Note™ 10.1 is now available in U.S. Cellular stores and at uscellular.com. The 16GB Galaxy Note 10.1 is $499.99 when paired with a plan with 2GB or more of data. 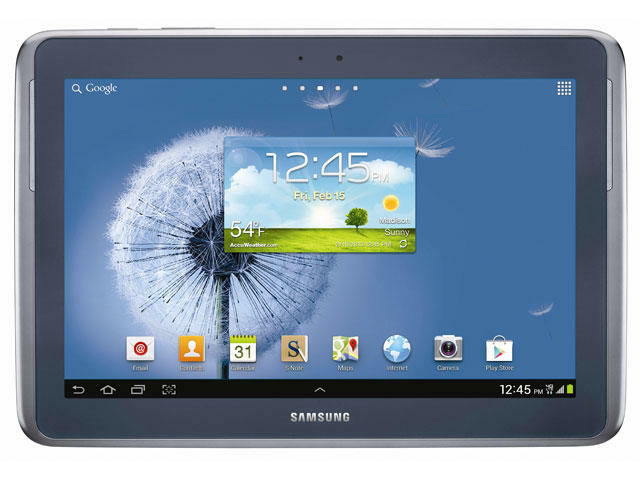 The Galaxy Note 10.1 joins U.S. Cellular's innovative line-up of 4G LTE devices that includes the Samsung Galaxy S® III, Samsung Galaxy Note® II and the Samsung Galaxy Tab™ 10.1. Customers who purchase the Galaxy Note 10.1 from U.S. Cellular receive benefits no other carrier offers, including a valuable rewards program that recognizes customer loyalty. "The Samsung Galaxy Note 10.1 makes it easier to get more work done and stay connected while you're away from the office, and enhances the moments you share with your family too," said Edward Perez, vice president of sales and marketing operations for U.S. Cellular. "Its speed and performance are even better when backed by the 4G LTE network, which delivers data up to 10 times faster than 3G." The Samsung Galaxy Note 10.1's integrated S Pen offers users with the precision of a pen and the control of a mouse. With S Pen, users can take meeting notes, personalize emails, edit documents and more. The S Pen can also be used as a tool for PC-like shortcuts and to preview content simply by hovering. There's also a multi-window capability to browse the web, check emails, watch videos and work on office documents at the same time. The Galaxy Note 10.1 includes a free preloaded version of Adobe® Photoshop Touch and 2GB of free file storage in Adobe's Creative Cloud. Consumers and artists alike can use Adobe Photoshop Touch to create presentation graphics, works of art, or simply modify photos. With the S Pen, it's a breeze to cut away layers or paint new backgrounds. The Samsung Galaxy Note 10.1 also includes Samsung's Smart Remote, leveraging a universal remote control application and integrated infrared (IR) blaster to optimize TV watching experiences. Control any TV from your Galaxy Note 10.1 and get a personal guide that makes it easier to find something everyone wants to watch. With the powerful Android™ 4.1 operating system, users can browse swiftly and smoothly through apps and all of the functions and features of the Galaxy Note 10.1. Google Now sends automatic and real-time notifications such as traffic alerts, sports scores and weather bulletins customized to the user's location and interests. Google Voice Search allows you to get search results on-the-go by simply speaking the question directly you're your phone. Samsung, Galaxy, and Note are trademarks of Samsung Electronics Co., Ltd. Other company names, product names and marks mentioned herein are the property of their respective owners and may be trademarks or registered trademarks. Samsung Mobile is the No. 1 mobile phone provider in the United States based upon reported shipment data, according to Strategy Analytics, North America Handset Vendor Marketshare, Q4 2012.